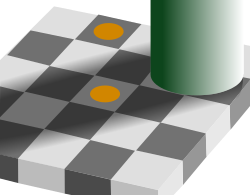 The orange disk and the brown disk have exactly the same objective color, and are in identical gray surrounds; based on context differences, humans perceive the squares as having different reflectances, and may interpret the colors as different color categories; see same color illusion. ↑ Craig F. Bohren (2006). Fundamentals of Atmospheric Radiation: An Introduction with 400 Problems. Wiley-VCH. आई॰ऍस॰बी॰ऍन॰ 3527405038.